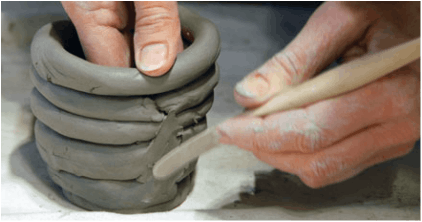 Have you wanted to try your hand at pottery? We can help you unleash your creative side - no artistic skills required. Learn how make various items using coiling and handbuilding techniques. 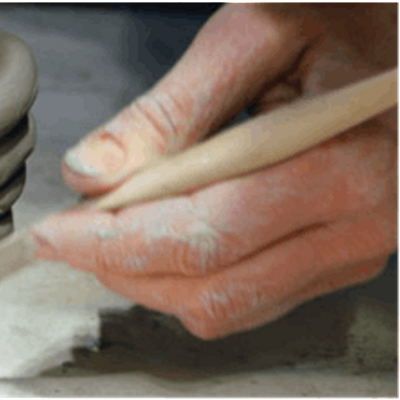 You will be shown step-by-step, and then its your turn to get your hands dirty and discover the Power of Pottery. It's the perfect way to calm the mind, relieve stress & anxiety, and escape from the daily pressures of modern life. But don't take my word for it - come discover for yourself! Includes a generous amout of clay, materials, tool use, personal tuition and post production costs: glazes and two kiln firings. Note: does not include working on the wheel. Price is per person. Maximum 6 spaces. Finished items will be available to collect from the studio 6-8-weeks after the event. Are there any minimum age requirements to enter the event? Regret - ages 16+ only. See map location. Take Entrance A and drive to the end. Free parking. No need to bring anything as all materials and tools supplied. Whilst I'm happy to advise and offer an ability rating for each course intended as guidance, it is ultimately your responsibility to decide whether a session is suitable or not. All bookings are subject to these booking conditions. If you are unsure whether a certain course is suitable for you, please ask and I will guide you. All courses have a limit to clay and glaze usage and semi-mass production is strictly prohibited. Cancellation terms apply as below. All events must be booked and paid for in full at the time of booking and at least 48 hours before the event date. Late bookings will be taken at the discretion of the potter. Cancellations with less than 7 days notice will not receive any refund unless your space can be filled. The potter will have prepared in advance for the number of people who booked. Cancellations up to 30 days before the event start date will receive a 100% refund. Cancellations up to 7 days before the event start date will receive a 50% refund. If you unable to attend at short notice, feel free to have someone come in your place. If the potter has to cancel or change the date of the event, then we will aim to give you as much notice as possible and you will be offered an alternative date or a refund. NOTE: There are no guarantees in the pottery production process. Items can unexpectedly break, crack, warp and even explode during a bisque or glaze firing. Tribe Creations does not accept responsibly of item damage due to the production process. Please also note that glazes will sometimes not come out as expected - it's part and parcel of the creation process. 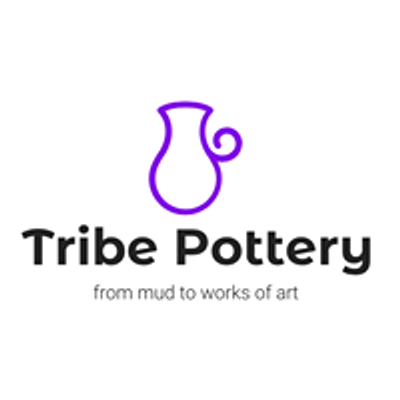 Tribe Pottery will not be held responsible for colour loss or variances. CLAY HEALTH & SAFETY: do not book or attend pottery lessons/workshops if you are allergic to, or react in any way to clay or glazes. Do not ingest clay. The clay used is non-toxic but consumption is discouraged. All glazes used are lead-free. Do not inhale clay dust, glaze dust or fumes. Wear a dust mask and disposable gloves at all times. An apron must be worn in the studio to avoid clothes getting soiled. Do cut long nails down to a short length and tie long hair up, away from face. All tools and equipment used at your own risk. COLD WEATHER (WINTER) : The studio gets quite cold in winter, so please do dress warm. I do have a heater, but the heat does escape due to the building type. If approaching from Broadmeadow Lane direction: directly after going over the bridge, take the very next sharp left (it’s tucked away behind a wall so you can’t see it) directly opposite Speciality Minerals. This is Entrance A. Drive through the gates to the end of the drive and park up anywhere - free parking. The studio is situated at the top left. If approaching from Lifford Lane direction: take the second right just before crossing the bridge - opposite Speciality Minerals. This is Entrance A - again, it’s tucked away. If you view the map you’ll see the unnamed road leading into Entrance A. If you get lost, simply give me a call - 07976 972 628.